Are businesses creating a more peaceful downtown through a new noise ordinance — or a more boring one? Harpman Hatter's amplified harmonica helped instigate a proposed change in city law. Even a block and a half away, three stories up, through the glass windows at the Spokane Downtown Partnership, the wail of a harmonica can still be heard. That wail belongs to “Harpman Hatter,” a street musician whose amplified music often blasts through the summer downtown. Hatter’s noise is not alone. When he pauses, generic soft rock music — from the tiny speakers of River Park Square — can be heard a block away. In January of 2010, Spokane’s citywide noise ordinance changed: Performers could be up to 10 decibels louder than the surrounding noise, a tricky metric to gauge. Since then, businesses and citizens have complained about all sorts of noise — not just the downtown ruckus, but also the residential thrum of air conditioning units and swimming pool motors. So in September, the city formed a noise ordinance task force, which recently proposed to ban street performer noise if it’s audible from 100 feet — a distance equal to the length of more than two school buses. The Downtown Spokane Partnership, a business advocacy group that was part of the task force, passed around a petition detailing the proposal, arguing it would balance a lively street performer scene with the needs of local businesses. Within 24 hours, the petition gathered 231 signatures from downtown businesses such as Runner’s Soul and Wheatland Bank. We sat down with DSP’s vice president, Marla Nunberg, and talked about mimes, harpsichords and the difficulties of measuring noise. INLANDER: What was the issue with the old noise ordinance? NUNBERG: The part that’s really hard to measure is the ambient noise. What is that ambient noise level? … [The task force] looked at the entire noise ordinance, bit by bit. They hired a noise specialist out of Seattle. It was very scientific. … What it’s doing is not changing anything. It’s just changing the method of measurement to something a little more easily measured. Who’s been hearing all these complaints about local street musicians? They’ve gone to the police department, to Crime Check, to the code enforcement at the city hall, to our office here at the Downtown Partnership as we represent downtown businesses, and to building managers that have contacted us about it. What sort of businesses complain most? I would say offices. They’re doing a different type of work. … We heard from one office, that was on a fourth floor, that was having difficulty with their staff meetings in their conference rooms. … One organization already had some sort of civil suit, so a particular street musician couldn’t come on their property…. One comment came from a street performer [saying] they don’t like the amplification that drowned out their own music. Which musician brought in the most complaints? 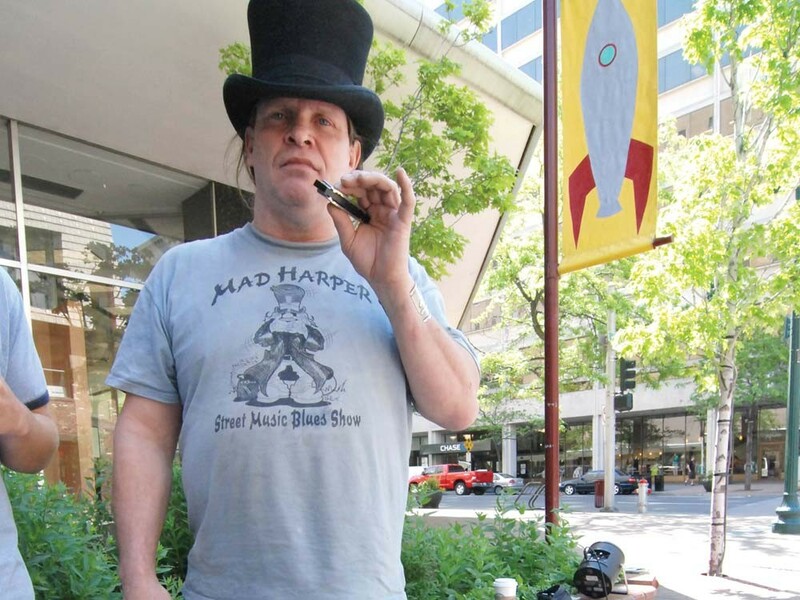 Most complaints we received from businesses have been about [amplified harmonica player] Harpman Hatter. But there are other musicians as well. But the music from River Park Square can be heard from over 100 feet away. What about them? We’ve heard a lot about that this week. ... People saying that in order to be fair, River Park Square would have to follow similar guidelines within the noise ordinance. What’s DSP’s problem with street musicians? We support street performers. We hire street performers. We make a point of paying street performers. But when you see people walking by somewhere and they’ve got to plug their ears, then it’s a noise level perceived as unacceptable. What would the ideal downtown Spokane sound like? Here would be a perfect example: First Friday Art Walk, you hear a band playing at Madeleine's, people having a good time, but still able to have conversations. ... We want some variety, with things moving and changing. So if I'm out there on a street corner blasting my harpsichord, will I get in trouble? I would say if you did it every day, at a certain level that was interrupting people's ability to do work or enjoy a public space. There's a number of things needed for anyone in order to have a citation: vibration, bass noise, the time of day, the frequency of the noise. All of these. Were you ever a street performer? I used to do clowning and mime-work.